I was originally introduced to this cafe/bunshik/restaurant/bar (ok wait, what exactly is it???) by chef friend Jung Sik Yim from Jung Sik Dang. It was supposed to be a quick stop over to say hello to staff/owners, and we were just coming from dinner prior. I was beyond stuffed & sad that I wasn't able to dive into the food that they served right before my eyes. Yes, this girl sometimes cannot fit more food in her tummy after packing in a 10-course meal. So I made it a point that I had to return. Return I did. Uh, like 3-4 more times. Each time with different friends so that I could see their reaction. Is this weird? Actually, I just wanted to come here like every week. Most of these friends were foodies and hard-core critics, but guess what? It ended up being on their list of favorites in New York by the end of the evening! So honestly guys-this is no fancy restaurant or a romantic date spot. It's your comfort zone. The place you definitely want to be when you need a drink, and eat food that will give you some serious pleasure. The interior is great (for New York) and you will feel like you're in some cafe in Korea. Strange. You'll end up craving some of the dishes the very next day. Is this a good thing? Hell yes. I'm just thrilled that there is place in NY where the bar/bunshik food resembles a lot of my favorites from Seoul. Except this is all under one roof. Take 31 offers a pretty extensive menu, and could be confusing at first glance. However, asking the staff to recommend their faves is usually the way to go. Or just look at my list below! Plus, this is not on the main 32nd street in Koreatown (which is great) so you don't see the crazy foot traffic of tourists. Maybe a bit hard to spot with all the construction around it, but well worth the effort to navigate if you are looking for a good find. Each table is served spicy ddukboki (rice cakes) on the house which is perfect to tie over the hunger until your dishes come out. Point-the soy dipping sauce that is served with the ddukboki is not for the ddukboki-it's for other appetizers (pajun, fried peppers, etc). I always make the mistake of dipping the ddukoki in the soy for some reason-makes absolutely no sense! Haha. Another 'must try item' is of course their special house made yuzu makgeolli! It's seriously one of the best things New York has to offer. Not sure if I had anything like it in Seoul! I cannot remember the exact name of this dish (kind of like a white miso udon/ramen with seafood). 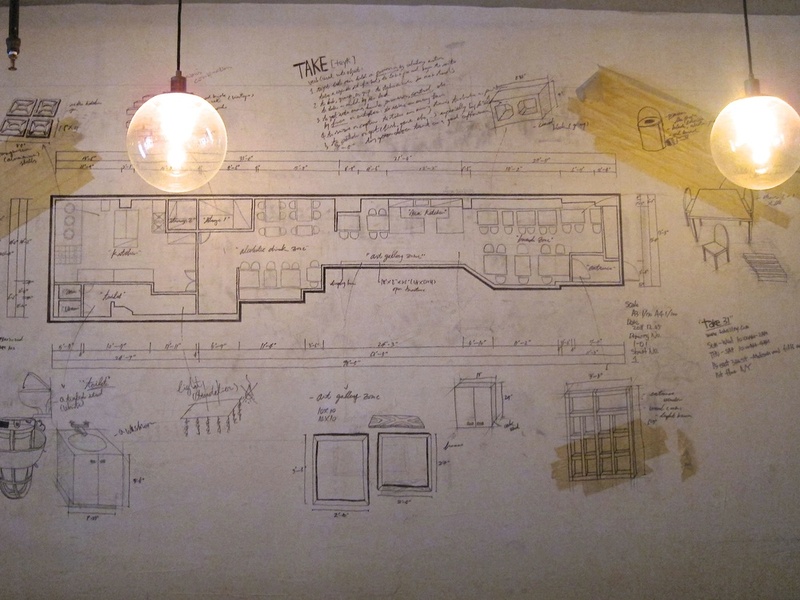 Love how they have their original floor plan on the wall! The size of these fried stuffed peppers are insane! Those who live in Seoul-these peppers seriously out-do the Han Chu ones in Sinsa-dong, I promise! The aftermath...from my second visit. I may not have discovered all of the great Korean spots in New York yet, but when it comes to certain Korean comfort foods-I've got that covered. *Portions are pretty good so the more in your party, the more dishes you should order to get a great variety! Just had to take a photo of this wall of spam. I'm convinced only Koreans think this is heaven.